Shortcuts are used to quickly perform common actions from anywhere. They can also be used to create new records and to navigate through the system with ease. Shortcuts are particularly useful when you are not sure where an entity is in a menu. Shortcuts are accessible via the icon in the navigation panel. Launch an action from the Most Used Actions list. This list is updated as you are using the system, and will initially contain the actions that you use the most. To see all the available shortcut actions, click See the full list link. All the menu and sub-menu items and Create forms are available. By clicking See the full list, you will be able to see the complete list of actions and shortcuts with their corresponding descriptions. Dashboard The Dashboard shortcut redirects you to the Dashboard of your OroCRM instance. Campaign Performance Campaign Performance redirects you to the Campaign Performance report page in Reports&Segments>Campaigns>Campaign Performance. Leads by Geography The Leads by Geography shortcut redirects you to the Leads by Geography report page in Reports&Segments>Reports>Leads>Leads by Geography. 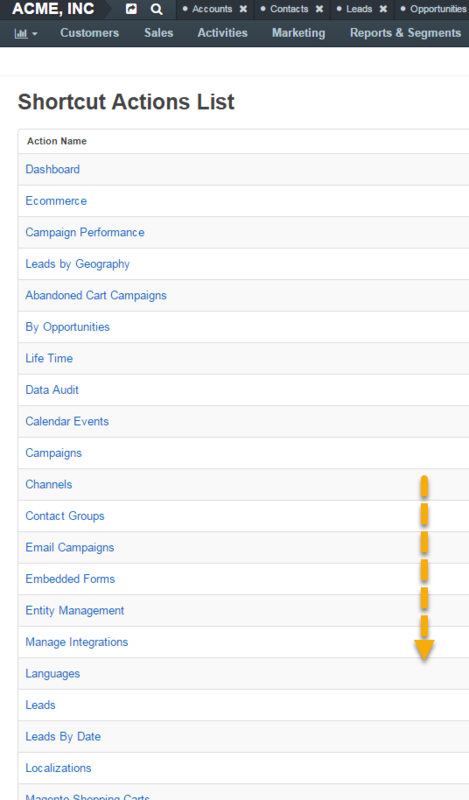 Abandoned Cart Campaigns The Abandoned Cart Campaigns shortcut redirects you to the Abandoned Cart Campaigns page in Marketing>Abandoned Cart Campaigns. By Opportunities The By Opportunities shortcut redirects you to the Accounts by Opportunities report page in Reports&Segments>Reports>Accounts>By Opportunities. Life Time The Life Time shortcut redirects you to the Account Life Time Value report page in Reports&Segments>Reports>Accounts>Life Time. Data Audit The Data Audit shortcut redirects you to the Data Audit page in System>Data Audit. Business Customers The Business Customers shortcut redirects you to the Business Customers page in Customers>Business Customers. Calendar Events The Calendar Events shortcut redirects you to the Calendar Events page in Activities>Calendar Events. Channels The Channels shortcut redirects you to the Channels page in System>Channels. Contact Groups The Contact Groups shortcut redirects you to the Contact Groups page in System>Contact Groups. Emails Campaigns The Email campaigns shortcut redirects you to the Email Campaigns page in Marketing>Email Campaigns. Embedded Forms The Embedded Forms shortcut redirects you to the Embedded Forms page in System>Integrations>Embedded Forms. Entity Management The Entity Management shortcut redirects you to the Entities page in System>Entities>Entity Management. Manage Integrations The Manage Integrations shortcut redirects you to the Integrations page in System>Integrations>Manage Integration. Languages The Languages shortcut redirects you to the Languages page in System>Localization>Languages. Leads The Leads shortcut redirects you to the Leads page in Sales>Leads. Leads by Date The Leads by Date shortcut redirects you to the Leads by Date report page in Reports&Segments>Reports>Leads>Leads by Date. Localizations The Localization shortcut redirects you to the Localizations page in System>Localization>Localizations. Magento Shopping Carts The Magento Shopping Carts shortcut redirects you to the Magento Shopping Carts page in Sales>Magento Shopping Carts. Magento Customers The Magento Customers shortcut redirects you to the Magento Customers page in Customers>Magento Customers. Magento Newsletter Subscribers The Magento Newsletter Subscribers shortcut redirects you to the Magento Newsletter Subscribers page in Marketing>Magento Newsletter Subscribers. Magento Orders The Magento Orders shortcut redirects you to the Magento Orders page in Sales>Magento Orders. Magento Custom Reports The Magento Custom Reports redirects you to the Reports page in Reports&Segments>Manage Custom Reports. Manage Segments The Manage Segments shortcut redirects you to the Segments page in Reports&Segments>Manage Segments. Marketing Lists The Marketing Lists shortcut redirects you to the Marketing Lists page in Marketing>Marketing Lists. Menus The Menus shortcut redirects you to the Menus page in System>Menus. Opportunities by Status The Opportunities by Status shortcut redirects you to the Opportunities by Status report page in Reports&Segments>Reports>Opportunities>Opportunities by Status. Opportunities The Opportunities shortcut redirects you to the Opportunities page in Sales>Opportunities. Business Units The Business Units shortcut redirects you to the Business Units page in System>User Management>Business Units. Cases The Cases shortcut redirects you to the Cases page in Activities>Cases. Contact Requests The Contact Requests shortcut redirects you to the Contact Requests page in Activities>Contact Requests. Scheduled Tasks The Scheduled Tasks shortcut redirects you to the Schedules page in System>Scheduled Tasks. Manage Dashboards The Manage Dashboards shortcut redirects you to the Manage Dashboards page in Dashboards>Manage Dashboards. Data Fields The Data Fields shortcut redirects you to the Data Fields page in Marketing>Dotmailer>Data Fields. Data Field Mappings The Data Field Mapping shortcut redirects you to the Data Field Mapping page. Email Studio The Email Studio shortcut redirects you to the Email Studio page. Templates The Templates shortcut redirects you to the Email Templates page in System>Emails>Templates. Jobs Lists The Job Lists shortcut redirects you to the Job Lists page with a list of Message Queue jobs in System>Jobs. Notification Rules The Notification Rules shortcut redirects you to the Notification Rules page in System>Emails>Notification Rules. Maintenance Notifications The Maintenance Notifications shortcut redirects you to the Maintenance Notifications page in System>Emails>Maintenance Notifications. Organizations The Organizations shortcut redirects you to the Organizations page in System>User Management>Organizations. System Information The System Information shortcut redirects you to the System Information page in System>System Information. System Calendars The System Calendars shortcut redirects you to the System Calendars page in System>System Calendars. Tags The Tags shortcut redirects you to the Tags page in System>Tags Management>Tags. Taxonomies The Taxonomies shortcut redirects you to the Taxonomies page in System>Tags Management>Taxonomies. Processes The Processes shortcut redirects you to the Processes page in System>Processes. Show Calls List The Show Calls Lists shortcut redirects you to the Calls page in Activities>Calls. Compose Email The Compose Email shortcut opens the Compose Email window. 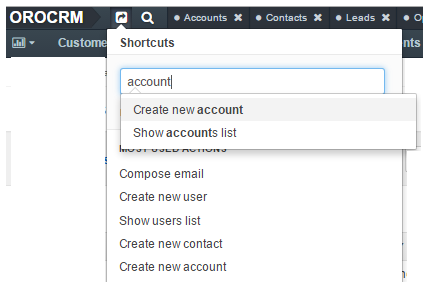 Show Accounts List The Show Accounts List shortcut redirects you to the Accounts page in Customers>Accounts. Show Contacts List The Show Contacts List shortcut redirects you to the Contacts page in Customers>Contacts. Show Users List The Show Users List shortcut redirects you to the Users page in System>User Management>Users. Create New Account The Create New Account shortcut redirects you to the Create an Account form. 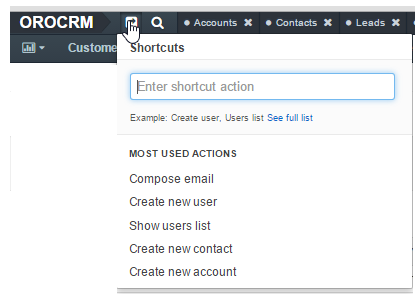 Create New Contact The Create New Contact shortcut redirects you to the Create Contact form. Create New Contact Group The Create New Contact Group shortcut redirects you to the Create Contact Group form. Create New Group The Create New Group shortcut redirects you to the Create New Group form. Create New Role The Create New Role shortcut redirects you to the Create New Role form. Create New Tag The Create New Tag shortcut redirects you to the Create New Tag form. Create New Taxonomy The Create New Taxonomy shortcut redirects you to the Create New Taxonomy page in System>Tags>Management>Taxonomies. Create New User The Create New User shortcut redirects you to the Create User form. Configuration The Configuration shortcut redirects you to the Configuration page in System>Configuration. Tasks The Tasks shortcut redirects you to the Tasks page in Activities>Tasks. Total Forecast The Total Forecast shortcut redirects you to the Total Forecast report page in Reports&Segments>Reports>Opportunities>Total Forecast. Translations The Translations shortcut redirects you to the Translations page in System>Localization>Translations. Groups The Groups shortcut redirects you to the Groups page in System>User Management>Groups. Roles The Roles shortcut redirects you to the Roles page in System>User Management>Roles. Tracking Websites The Tracking Websites shortcut redirects you to the Tracking Websites page in Marketing>Tracking Websites. Won Opportunities By Period The Won Opportunities By Period shortcut redirects you to the Won Opportunities By Date Period page in Reports&Segments>Reports>Opportunities>Won Opportunities by Period. Workflows The Workflows shortcut redirects you to the Workflows page in System>Workflows.